McCann New York won its fourth Grand Prix, this time in the Titanium Lions, at this year's Cannes for its Fearless Girl statue on Wall Street. The work, for State Street Global Advisors, had already picked up the top prize in the Glass Lions, PR Lions, and Outdoor Lions – alongside Twitter in the case of the latter. 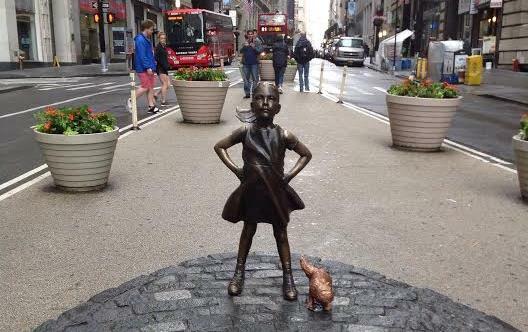 More from Cannes: Ketchum wins big in PR Lions as Fearless Girl bags the Grand Prix; Fearless Girl racks up Lions and Grand Prix wins in non-PR categories. The Titanium Lions celebrates "game-changers," specifying: "Entries will need to break new ground in branded communications; that is, provocative, boundary-busting, envy-inspiring work that marks a new direction for the industry and moves it forward." There were three other winners in the category, in which there are no gold, silver, and bronze awards. All three are U.S. agencies: 180LA for Boost Mobile, "Boost your voice;" Ogilvy New York for Amnesty International, "The refugee nation;" and MJZ Los Angeles with Black Frame New York, for Kenzo Parfums, "My mutant brain." Fearless woman: State Street's Anne McNally on how an iconic statue came to be. Cannes talk: What's in an idea?